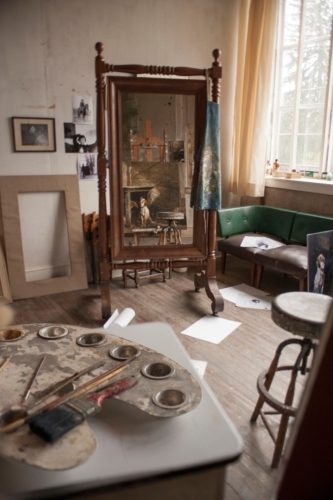 Today, we’re talking about… Andrew Wyeth’s Studio Tour. One of my favorite museums, the Brandywine River Museum in Chadds Ford, PA, is opening Andrew Wyeth’s Chadds Ford studio for tours on July 3rd. Betsy James Wyeth gave the museum the studio in 2010. The tour offers insights into Wyeth’s life, his working methods and sources of inspiration. Visitors will learn about his creative process and see his library, photos, fencing gear, military miniatures collection, and more. To celebrate the opening, the museum is presenting A Painter’s View: The Andrew Wyeth Studio, featuring the artist’s own view of his studio in paintings and drawings lent from private collections. Wyeth painted in the studio from 1940 until mid-2008, and the studio is virtually intact, looking as it did when he last left it. Wyeth was a very private person and he’d retreat to his studio where he painted some of his most important work including Winter 1946 and Trodden Weed. I find his depictions of the country, farm life and the people there especially interesting, perhaps since it is a world unfamiliar to me. I always enjoy visiting the Brandywine River Museum and I’ll definitely be back to check out this studio tour and exhibit.